Sound "Utterly charming, intensely musical, as smooth as silk." "Exceptionally quiet," too. "The PH5 throws a huge soundstage, locating performers precisely within it." "High-frequency detail abounded in just about every LP I played. It wasn't over-emphasized, just a natural part of each instrument's sound." Features "The PH5 uses a hybrid circuit that employs both solid-state and tube gain stages. The input stage is a low-noise JFET section, while the RIAA equalization and line stages use four Electro-Harmonix 6922EH tubes." "The PH5s slender remote control duplicates all functions on the front panel: power on/off, mute, loading impedance, and mono." Use "Gain is 57.5dB.... Audio Research expects that your line stage will provide additional gain, so forget about using the PH5 with a low-output cartridge and a passive line stage." Value "An exceptional hi-fi component that offers more in the way of sonics and convenience than its price would suggest." Most of the products we review on SoundStage! fall within the realm of high-end audio. Well, the manufacturer of the product reviewed here, Audio Research Corporation, helped invent high-end audio. Back when early transistor gear was gobbling up the hi-fi industry, with everyone rushing to get onboard with the "latest and greatest" technology no matter how it sounded, Audio Research was brave enough to say, "Stop! Youre going the wrong way." ARC put that philosophy into action with products like the SP3 preamp, which also resurrected the vacuum tube and proved it still had sonic value. If you were perceptive enough to buy an SP3 during its 1972-1976 production period, you could take advantage of Audio Researchs current offer to upgrade it so that it approaches "the performance of our current preamplifier product line." You see, Audio Research protects its customers investments by upgrading equipment when possible to current-model performance (and sometimes appearance). And unlike some "upgrades," Audio Researchs really are improvements -- clearly audible without having to strain ones ears and imagination. This review addresses one of Audio Researchs newest products, the PH5 phono stage, which was introduced at the CES earlier this year. The $1995 USD PH5 replaces the PH3 and the PH3-SE (a special edition of the PH3), but costs only as much as the standard PH3. The PH5 has a 19"-wide faceplate available in silver or black. Front-panel handles, long an Audio Research hallmark, are an $80 option. The PH5 uses a hybrid circuit that employs both solid-state and tube gain stages. The input stage is a low-noise JFET section, while the RIAA equalization and line stages use four Electro-Harmonix 6922EH tubes. Frequency response is down 3dB at 7Hz and 400kHz. Gain is 57.5dB, higher than previous PH-series phono stages. However, thats still lower gain than many phono stages from other makers, where 60dB is semi-standard and 70dB or more is available from some models. Audio Research expects that your line stage will provide additional gain, so forget about using the PH5 with a low-output cartridge and a passive line stage. The 14dB of gain from my deHavilland Mercury 2 line stage and my low-output (.3 mV) cartridge proved compatible with the PH5, partly because the PH5 is exceptionally quiet. "It is impossible to overload the PH5 with any MM cartridge on the market today. The output of MMs at the higher-output end of the scale (like some Grados, Shures, and Sumikos) is 4-5mV, whereas the maximum input of the PH5 is 70mV RMS (at 1kHz)! So, overload of the PH5 is simply not going to happen with a high-output MM cartridge." The PH5s slender remote control duplicates all functions on the front panel: power on/off, mute, loading impedance, and mono. The mono button enables you to play monophonic records with the vertical component of a stereo cartridge cancelled to reduce surface noise. The load button lets you set the cartridge-loading impedance remotely -- no fumbling around with tiny switches underneath or inside the phono stage. Standard loads are 47k ohms, 1k ohms, 500 ohms, 200 ohms, and 100 ohms. These are good general choices, but if you have a cartridge that needs a different load, such as 3 ohms, you can replace one of the standard values with it. This can be done at the factory as part of your order, or later by your dealer if the need for a special load impedance develops. Setup is straightforward, if not quite plug-and-play. First, remove the top cover and install the tubes. The thick, black damping rings around the tubes are there to control microphonics. Replace the cover and then place the PH5 in its operational position. Connect the tonearm leads and ground wire to the input jacks and ground lug, and the output interconnects to the output jacks. There are no switches or jumpers to set; everything is controlled from the front panel or remote. The load impedance was easy to set, but I found, much to my surprise, that it didnt make a huge difference in the sound of my MC cartridge, which has a recommended load impedance of 30 ohms. When I reviewed the Bel Canto PRe2P preamp last year, which also has remotely adjustable load impedance, different settings had greater audible effect, and I liked the sound with the 77-ohm setting best. With the PH5, I settled on 200 ohms, which illustrates that its not just the load but the phono stage itself that determines how a cartridge sounds. Utterly charming, intensely musical, as smooth as silk. Drat, Im running out of clichés. But lets cast banalities aside and get more specific. The PH5 throws a huge soundstage, locating performers precisely within it. To use a visual analogy, its as though the performers space is bathed in sunlight, letting you see details youve never seen before. But those details are completely integrated into the context of the music, not extraneous sounds that pop out of the mix unnaturally. The overall sound is organic and believable, assuming the recording is believable. If the recording was inexpertly cobbled together from various isolated musicians in sound booths or a multi-miked affair, youll hear its defining characteristics clearly. High-frequency detail abounded in just about every LP I played. It wasn't over-emphasized, just a natural part of each instrument's sound. On Leonard Slatkin and the Saint Louis Symphonys performance of the "Carmen Suite" from Carmen - Peer Gynt [Telarc 10048], the triangles tinkled clearly above the full orchestra, and I could hear both the initial strike of the hammer and the lengthy shimmering notes as the vibration decayed into silence. Bass was strong, too. The famous Telarc low frequencies thundered forth with their accustomed power, but also exhibited more detail and tunefulness than Ive heard before. The PH5 loves voices. On Eva Cassidys Songbird compilation [S&P Records S&P-501 ], her voice was achingly expressive on "Autumn Leaves," and was very poignant in the title track. Muddy Waters baritone voice on the song "My Home is in the Delta" from the Classic Records reissue of Folk Singer [Chess LPS-1483] projected powerfully, with no compression or distortion. Choral works like the Rutter Requiem [Reference Recordings RR-57], which ranges from quiet and peaceful to quite forceful, did not cause the PH5 to break a sweat. The spatial location of the choirs sections was very precise and free from grunge. Dynamics, while not overblown, were noteworthy on both the macro and micro ends of the scale. The PH5 handled large symphonic works with aplomb. All parts of the "Carmen Suite" recording, from the delicate flute solos to the massive orchestral climaxes augmented by Telarcs seismic bass drum, were played with complete ease. Of course, my Dynavector DRT XV-1 cartridge, which seems able to track anything, probably had something to do with it. 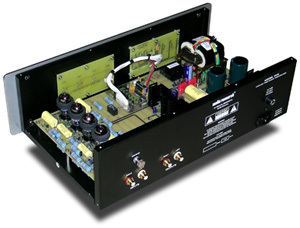 Power amplifier  Art Audio PX 25. Analog  Linn LP-12 turntable, Graham 2.2 tonearm, Dynavector DRT XV-1 cartridge, Dynavector P-75 phono stage. Power cords  Purist Audio Design Venustas and Blue Marble Audio Blue Lightning. Instrumental timbres were spot-on. With a fresh memory of our local symphony orchestras recent performance of the Bruch Violin Concerto No.1, I cued up Classic Records reissue of Jascha Heifetz and the New Orchestra of London [RCA LSC-2652 RE] playing the same work. Unsurprisingly, Heifetz excelled, but the RCA recording clearly placed him well in front of the orchestra, with a spotlight microphone on his instrument. His tone was a little harder than that of the soloist in our local concert, but the orchestras was delightful. As a former trumpet player, I always listen for accurate trumpet sound, and the recording of "Carmen Suite" has one of the most realistic-sounding recorded trumpets Ive heard. Via the PH5, the attack and release of notes were just perfect. I wish I had played so well. Toward the end of the review period, I began to experiment by using the PH5 first with a different cartridge and then with an aftermarket power cord and different tubes. The results were interesting. I mounted a new Clearaudio Aurum Beta S MM cartridge on my tonearm. When I connected it to the PH5, set for the MM-standard 47k-ohm load, the PH5s output level increased substantially. Considering that the Clearaudio MM cartridge has about ten times the signal of the Dynavector MC cartridge, the higher output is just what youd expect. I heard no indication that the increased signal might be overloading the PH5; I just heard clean, dynamic sound, with plenty of detail and nuance. High-and low-frequency extension were just as great as with the Dynavector cartridge, and dynamic impact was nearly as good. The Dynavector cartridge displayed a little more detail, but the Clearaudio cartridge got the tonality right. So even a relatively inexpensive cartridge ($499) benefited from use with PH5. I had used Audio Researchs power cord for most of the review period, but I couldnt resist trying an aftermarket cord as well. The stock power cord, which Audio Research includes because of its sonics, is quite decent, but a Blue Marble Audio Blue Lightning power cord made a slight improvement in bass extension and dynamic impact. The sound also became a smidgen more three-dimensional. Your favorite cord may sound even better. Finally, as any tubeophile knows, tube rolling is a way to alter the sound of a tube component -- and perhaps improve it. Because Im currently using affordable current-production JJ/Tesla 6922 tubes in the input stage of my amplifier, I tried a matched quad of cryogenically treated JJ/Tesla tubes in the PH5. I mostly liked what I heard: deeper bass and greater dynamics. I wasnt as crazy about a slight elevation of the high frequencies that sometimes emphasized surface noise. If you think the PH5 needs a little more high-frequency sparkle, JJ/Tesla or EI tubes will probably provide it. However, tube rolling is like switching interconnects: It can change a systems sound, but those changes may not be improvements. The PH5s stock Electro-Harmonix tubes are more than acceptable. The Dynavector P-75 phono stage I normally use is a solid-state unit that is relatively inexpensive: $595. In fact, its so inexpensive that Dynavector sometimes worries that, like the late Rodney Dangerfield, it wont get any respect. One of the reasons it costs so little is that it has a very simple circuit and an external wall-wart power supply. It is also miniscule and doesn't have a particularly solid-looking enclosure. But theres a lot going on in its small chassis -- the single input jacks feed either an MM or MC amp with adjustable load impedance, or a unique phono-enhancing circuit whose resistive load is zero ohms. This amplifying circuit was designed by Dynavector founder Dr. Tominari and is ideal for use with Dynavector cartridges like mine. Setting the mode and load of the Dynavector P-75 requires that you remove its outer case and move a series of small jumpers inside, making you appreciate the PH5s remote control. Sonically, the Dynavector P-75 tends to be brighter than the PH5, sometimes emphasizing surface noise on the frequently abused LPs I bring home from Half-Price Books and garage sales. The P-75 is quiet, with good dynamics and plenty of gain (up to 63dB). For $595, it definitely deserves respect. However, the PH5 is in a whole different sonic league. It sounds smoother, has no tendency to brightness, and is at least as quiet as the Dynavector. But more important, it digs deeper into the music and makes it sound more natural. Is it the tubes? They're probably part of the answer -- I really cant offer anything definitive. I just describe what I hear and feel, and the PH5 sounds wonderful, which makes me feel like listening longer. The Audio Research PH5 is an exceptional hi-fi component that offers more in the way of sonics and convenience than its price would suggest. And such a statement nowhere near describes the totality of its excellence! It breathes freely, so that music emerges in a more relaxed and appealing state. It is neutral, sounding neither like solid-state nor tube equipment. Its wide-open soundstage and timbral accuracy tempt listeners to ignore their bedtimes and engage in long listening sessions. Dispensing with hi-fi-speak for a moment, the PH5 just sounds believable and musically right. Since I started listening to it, my vinyl purchases have increased alarmingly. Better sound and more music are concepts that need no explanation, and they are the Audio Research PH5's true gifts. Warranty: Three years parts and labor; 90 days for tubes.